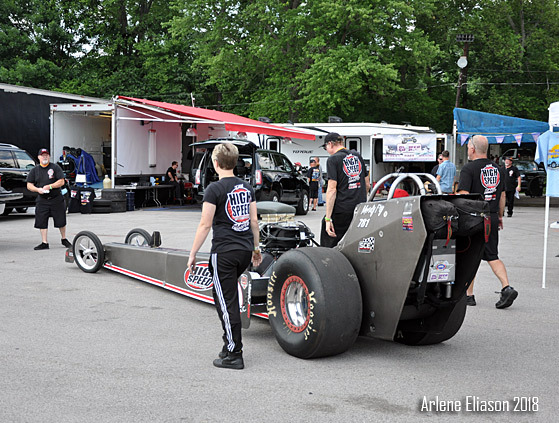 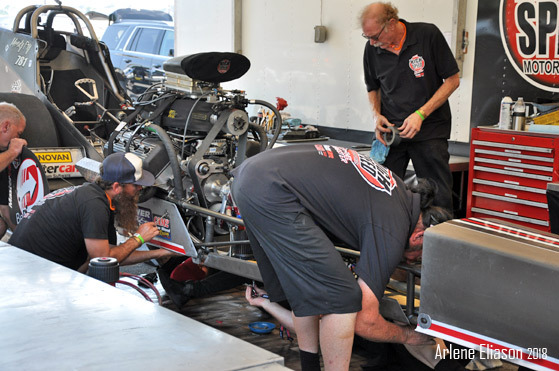 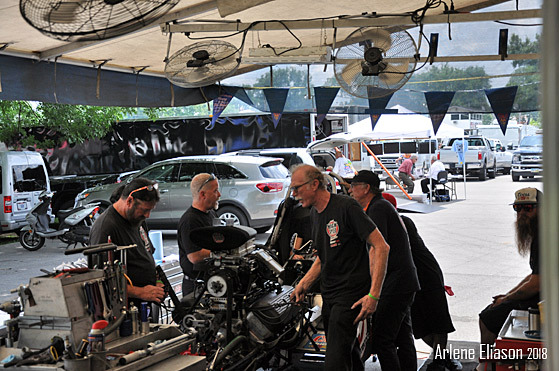 Bowling Green, KY 06.16.2018: When Tom & Rick Shelar leave Anaheim, CA for Bowling Green, KY with the dragster in tow, they know its not a fools mission. 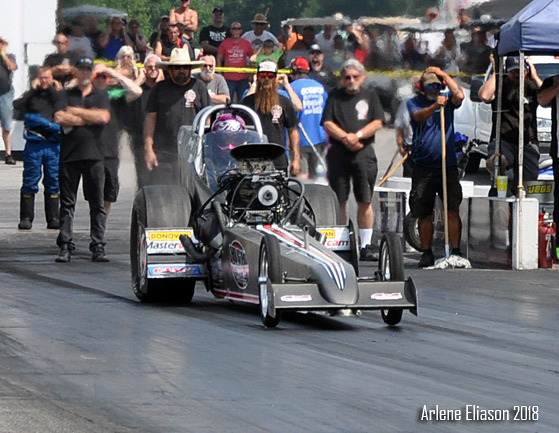 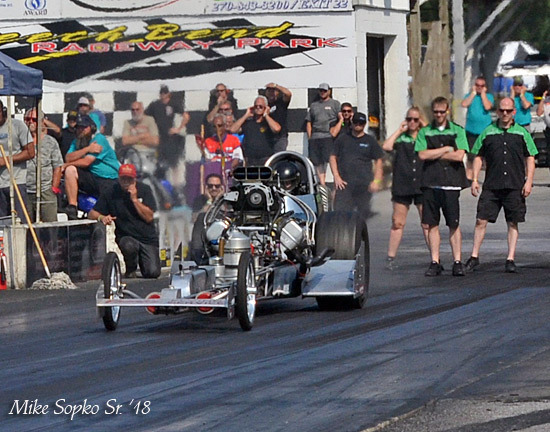 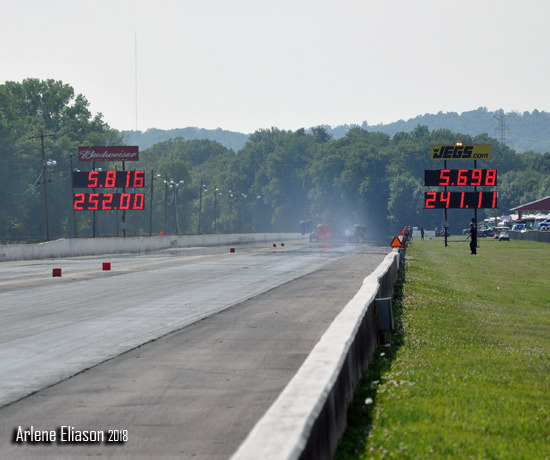 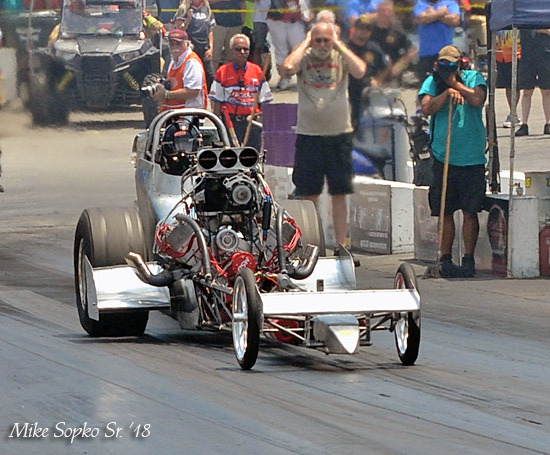 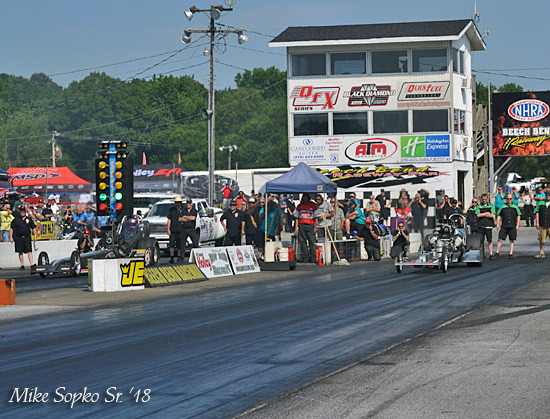 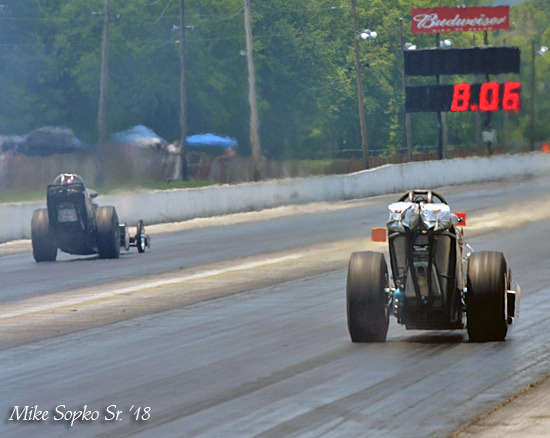 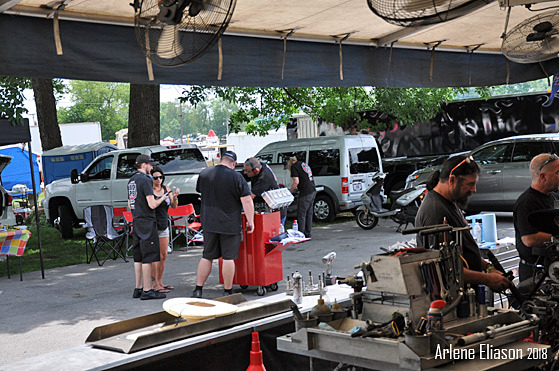 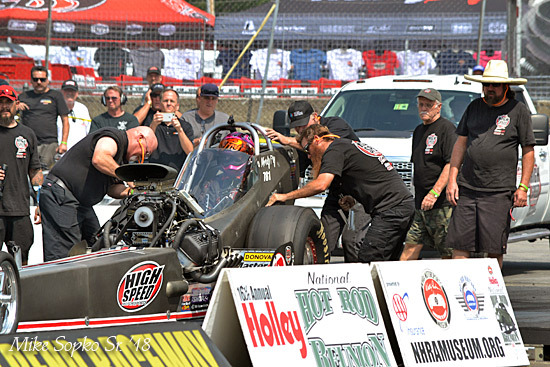 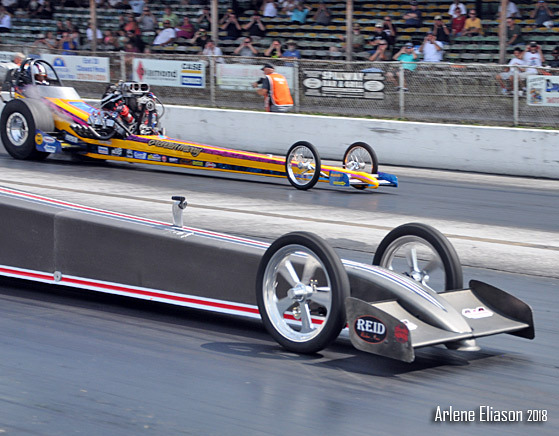 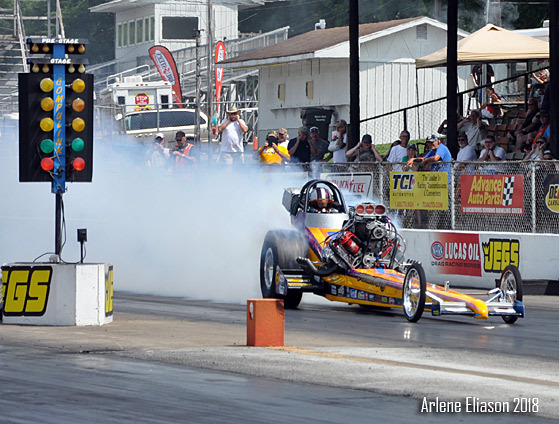 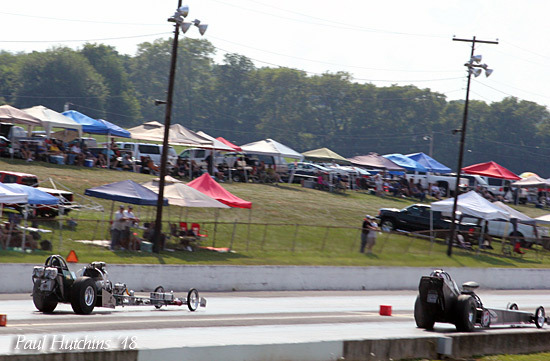 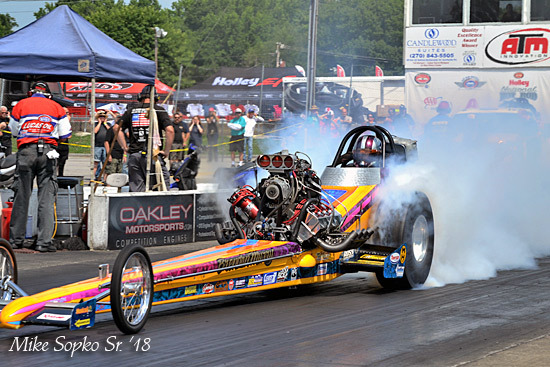 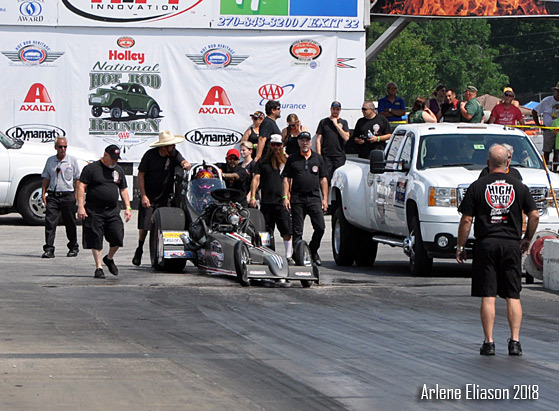 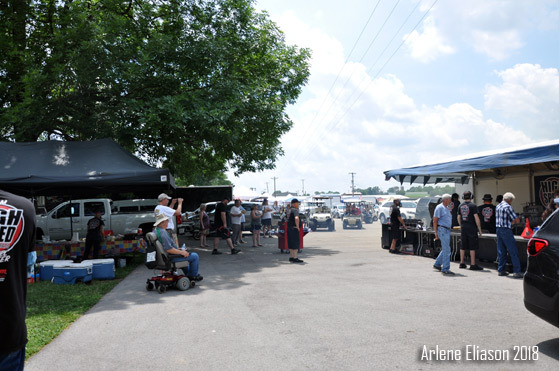 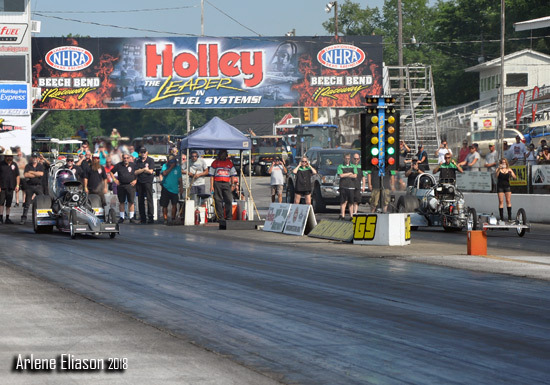 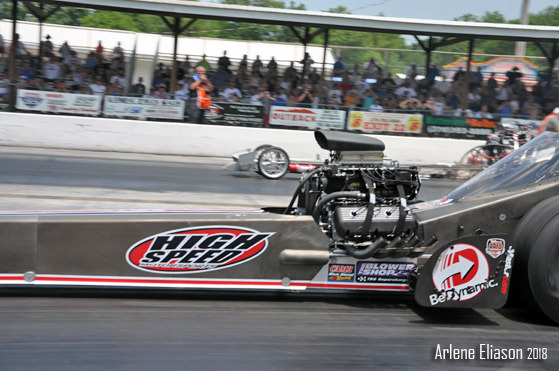 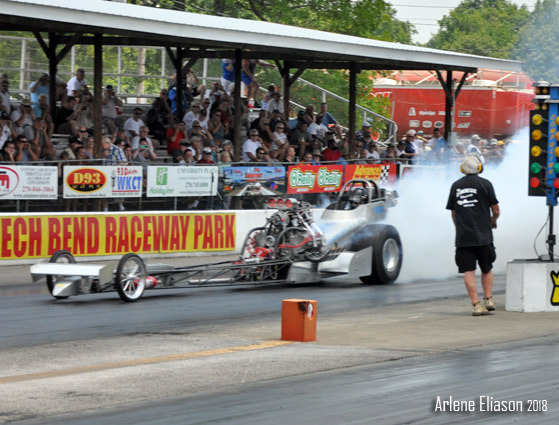 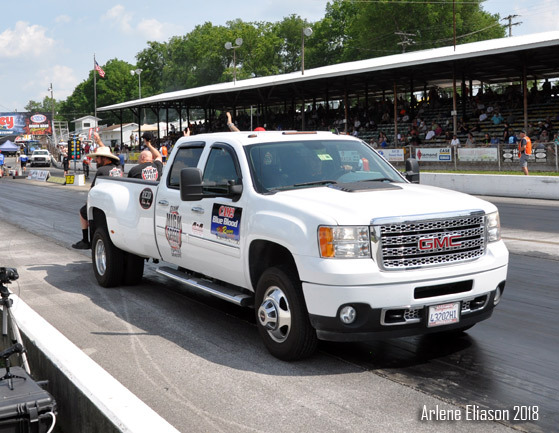 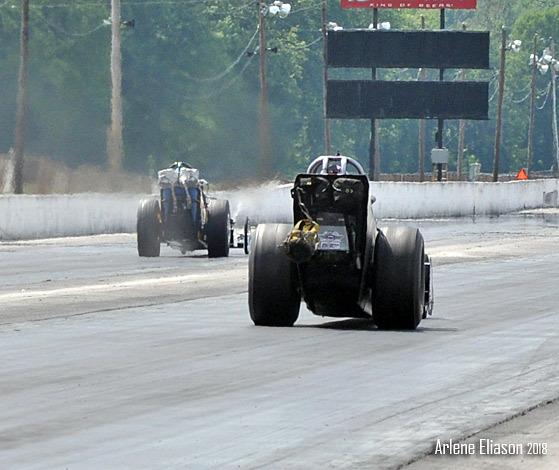 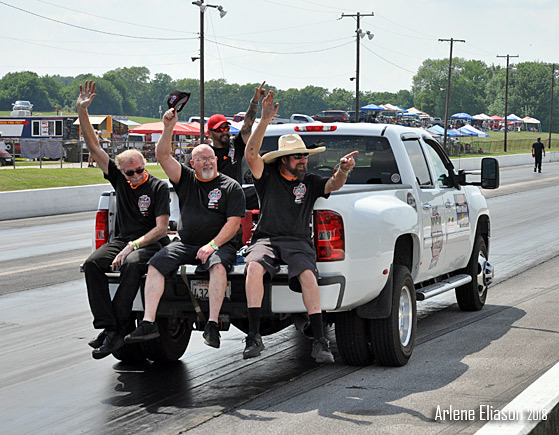 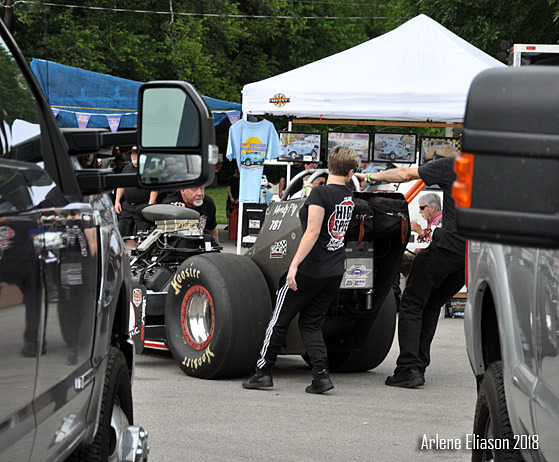 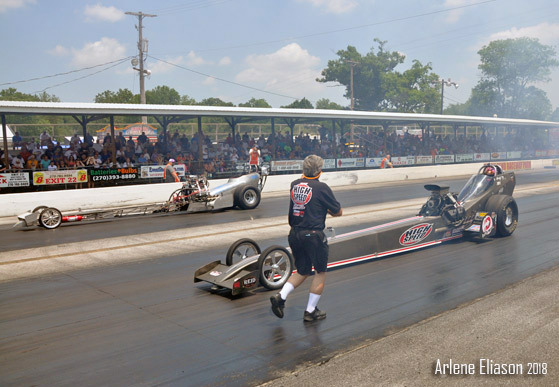 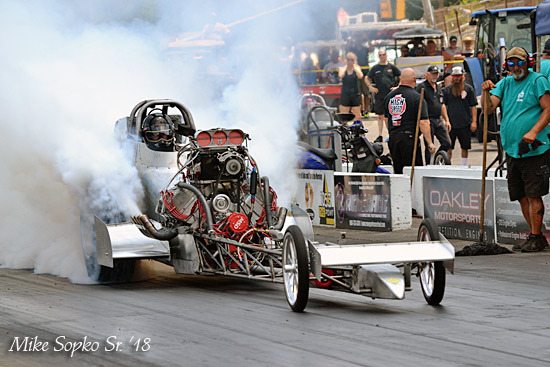 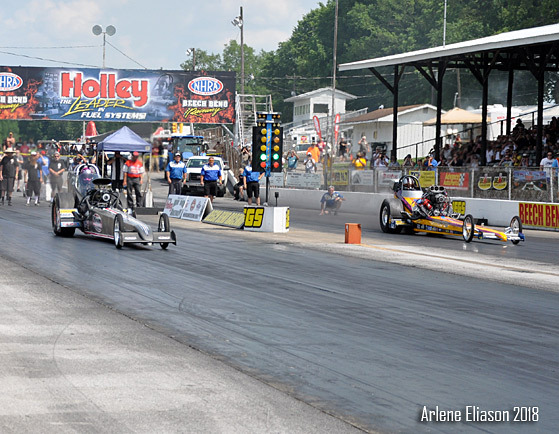 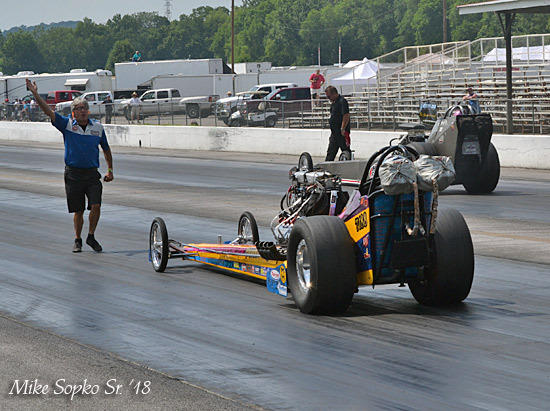 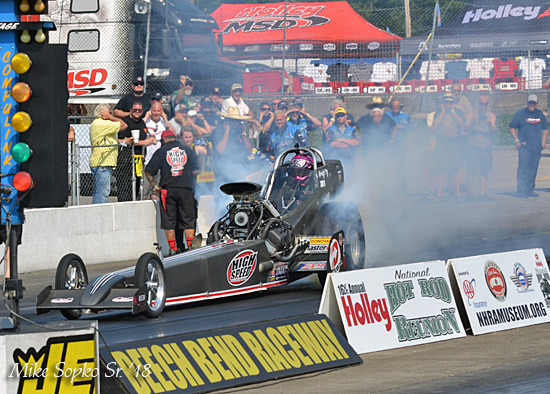 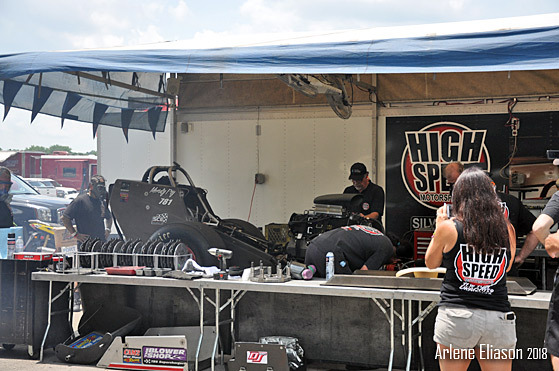 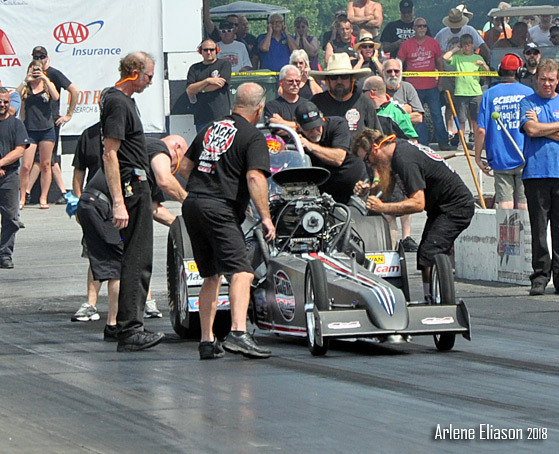 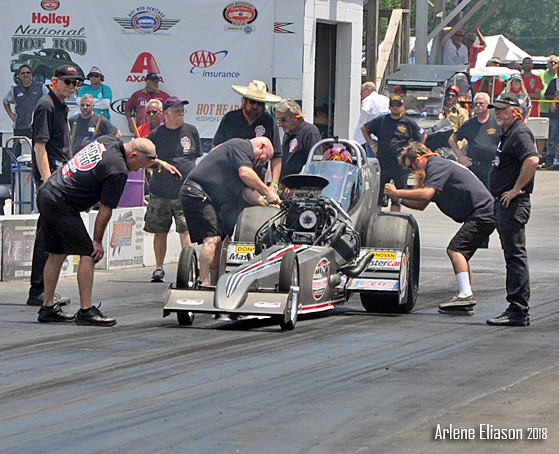 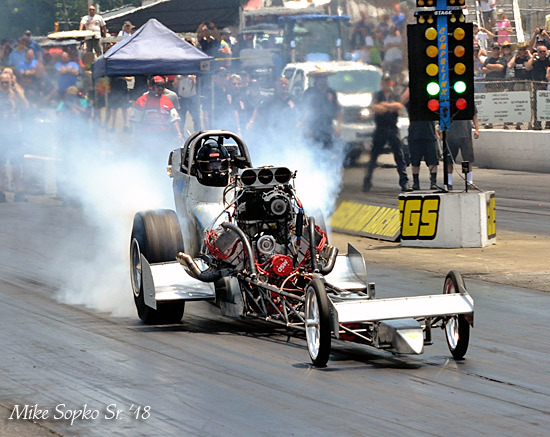 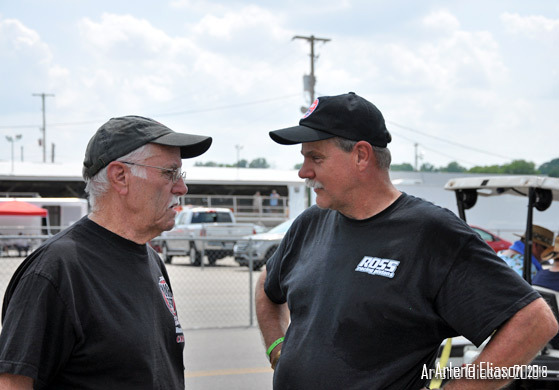 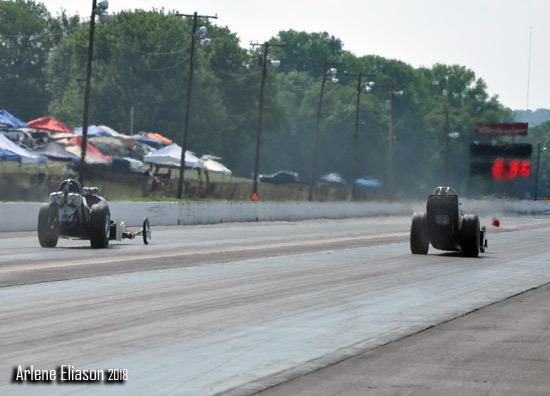 When it comes to the Holley National Hot Rod Reunion at Beech Bend Dragway, they own the Top Fuel title. 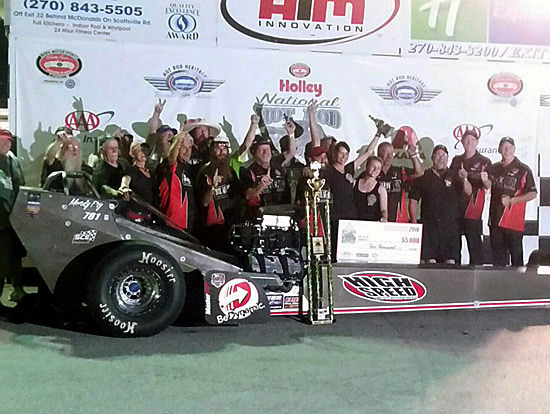 Team High Speed Motorsports has now been victorious for the 8th time, using 5 different drivers over the events 15 year history. 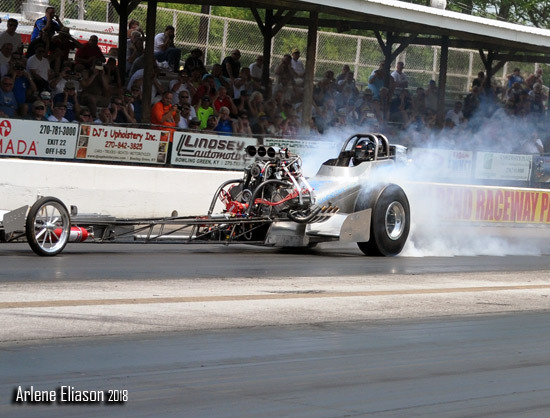 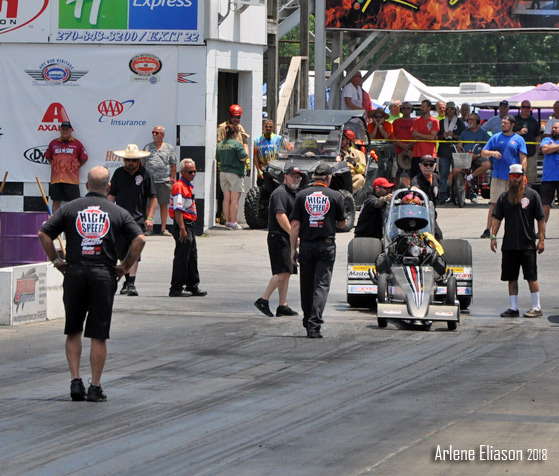 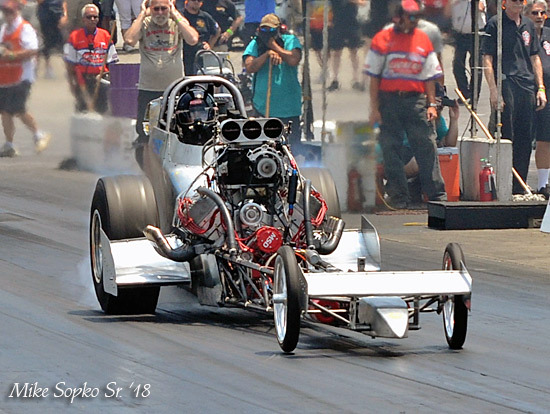 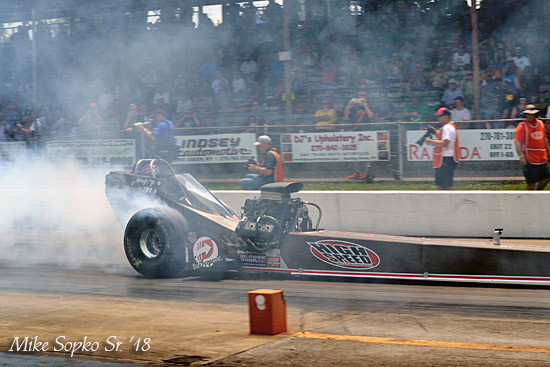 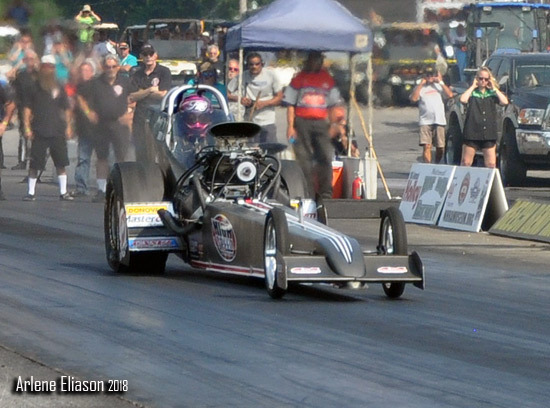 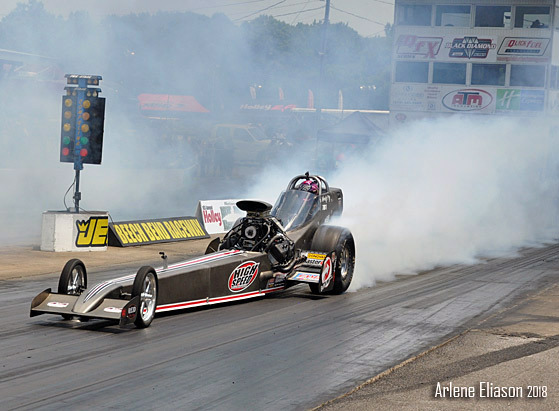 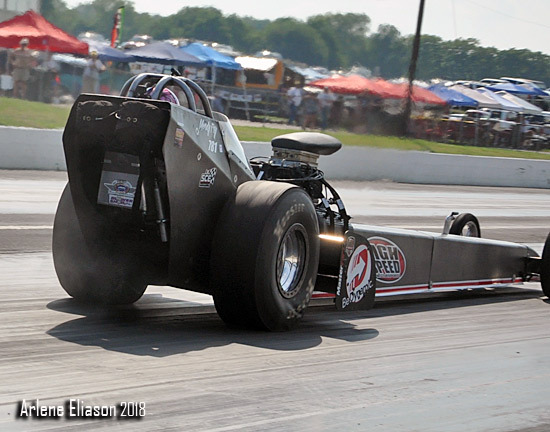 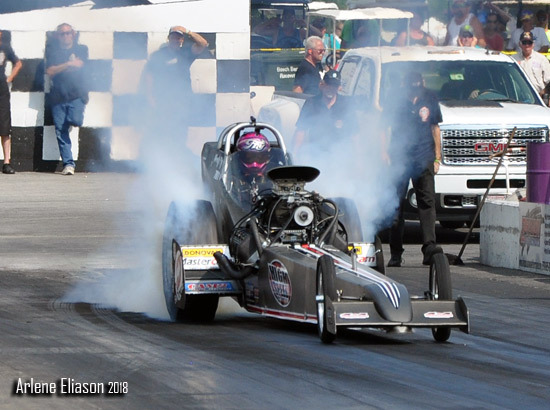 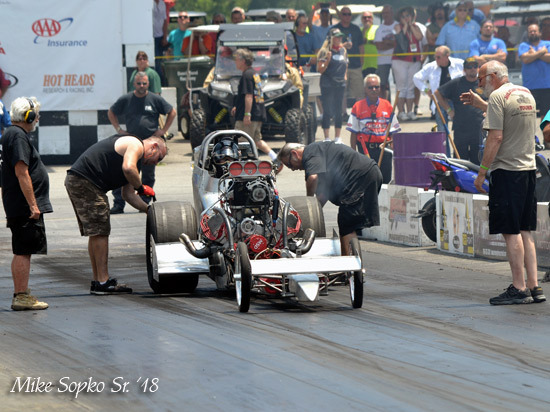 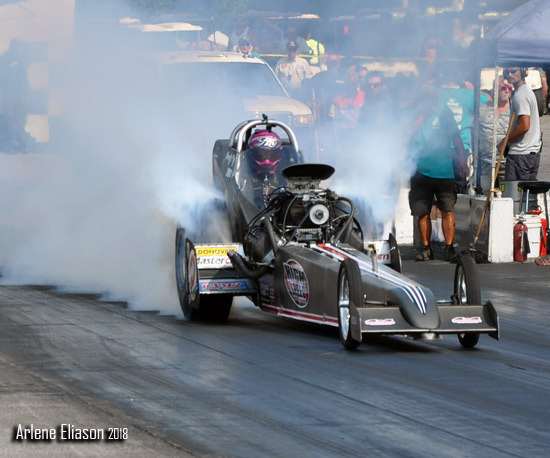 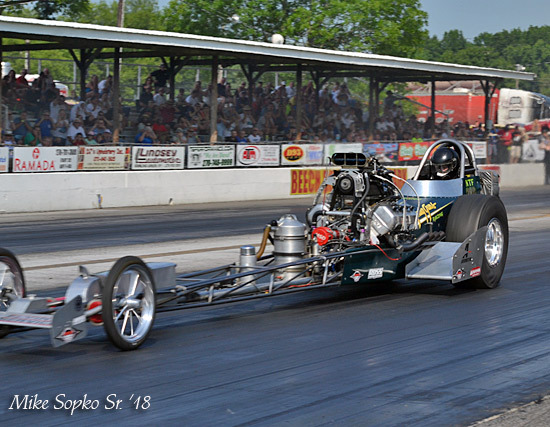 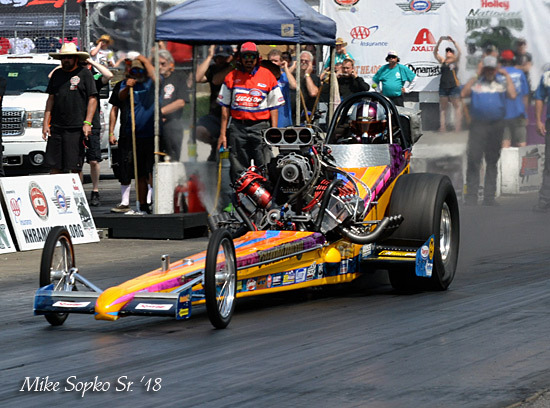 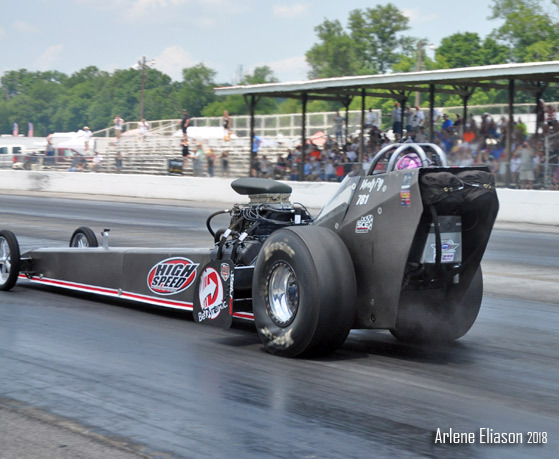 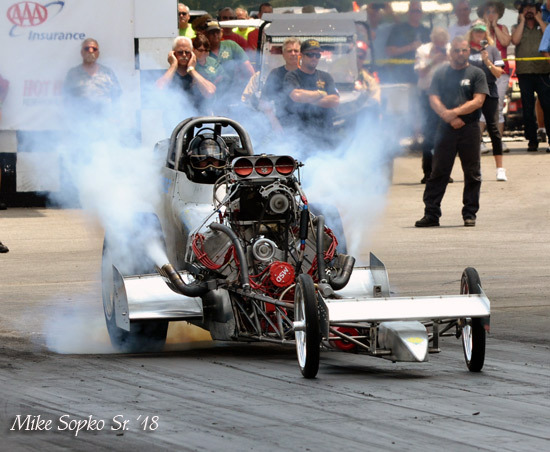 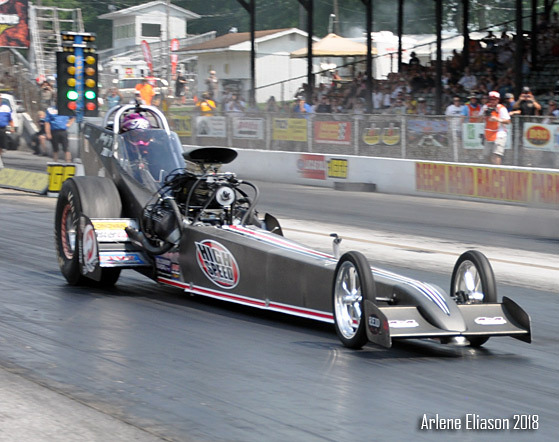 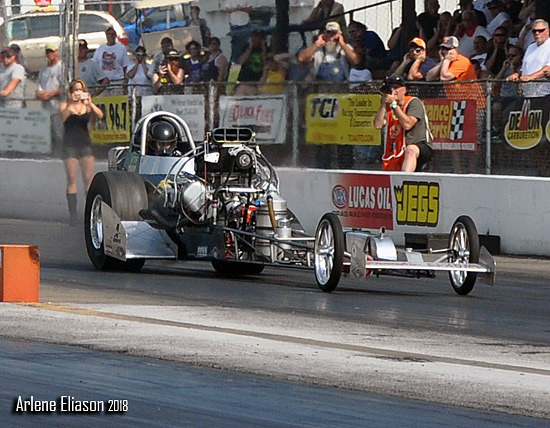 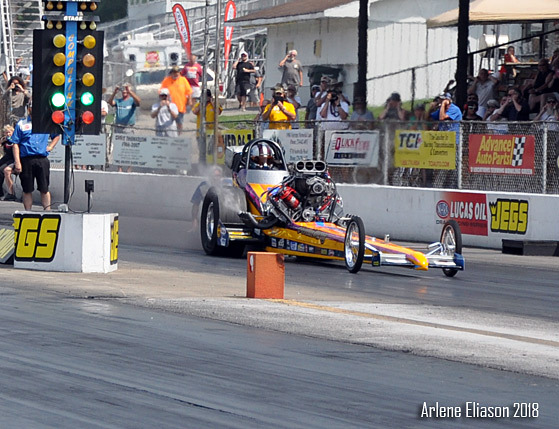 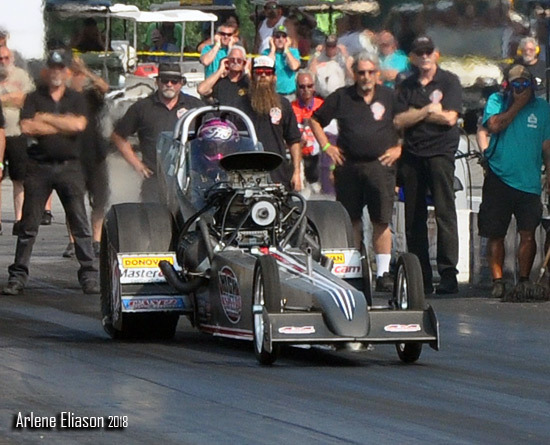 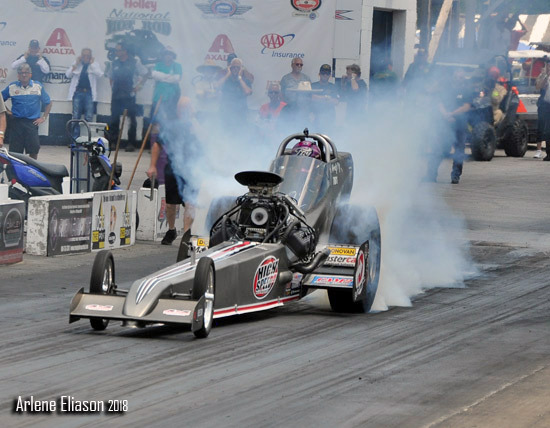 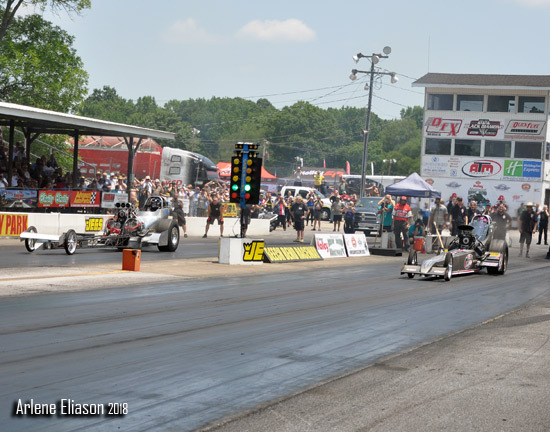 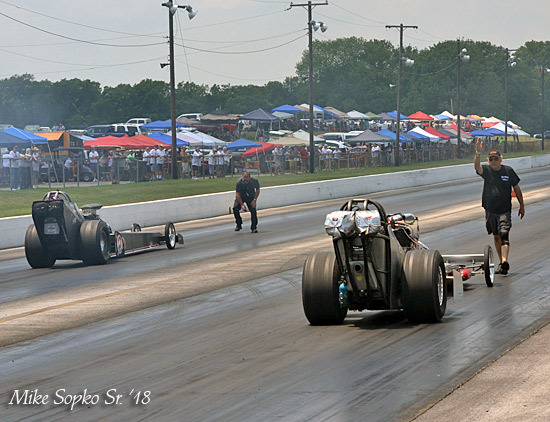 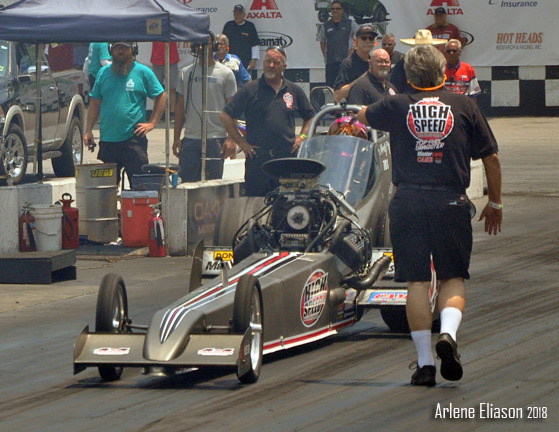 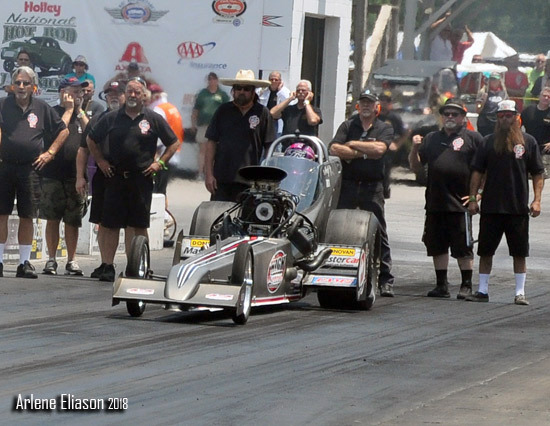 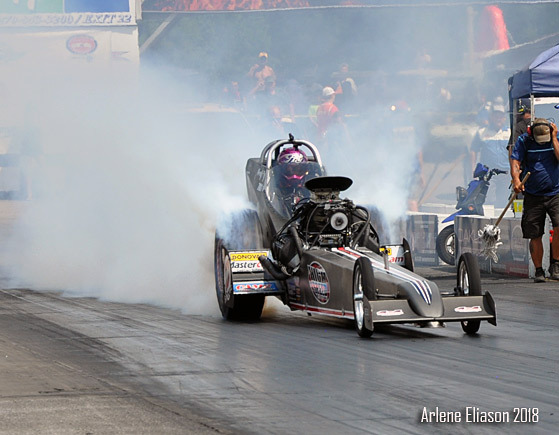 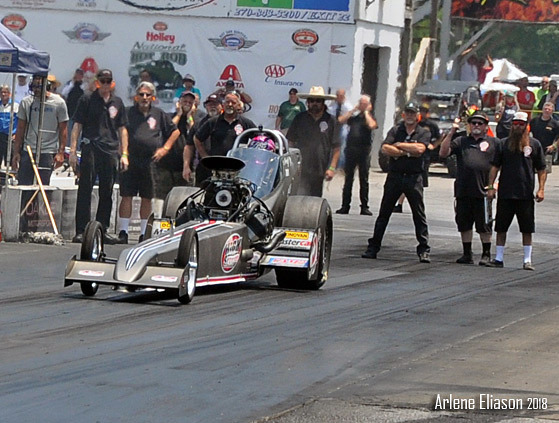 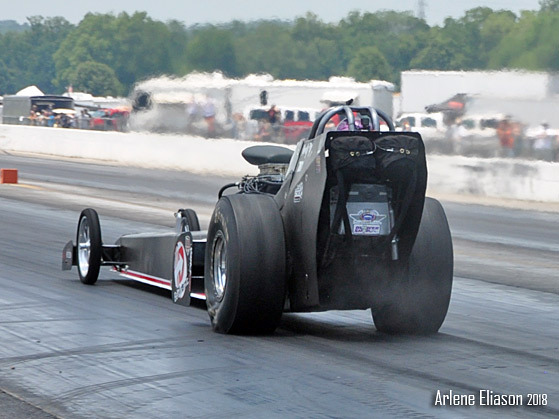 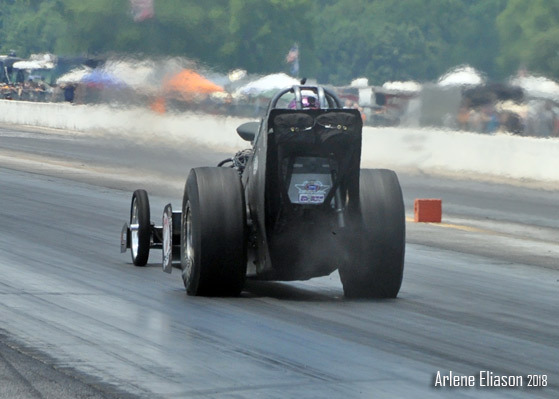 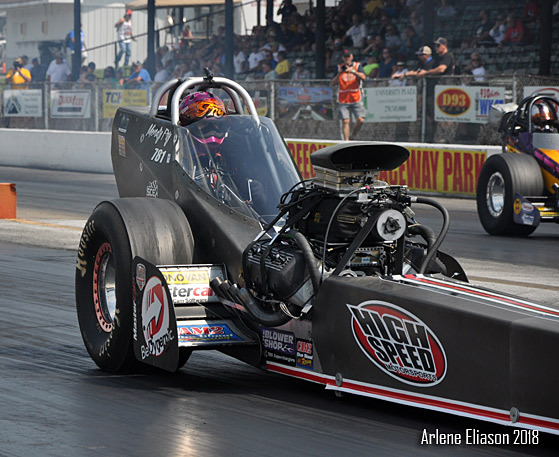 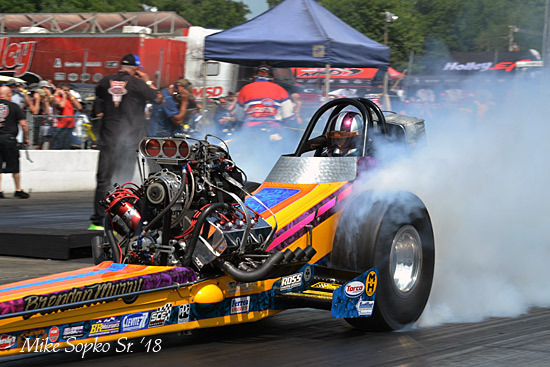 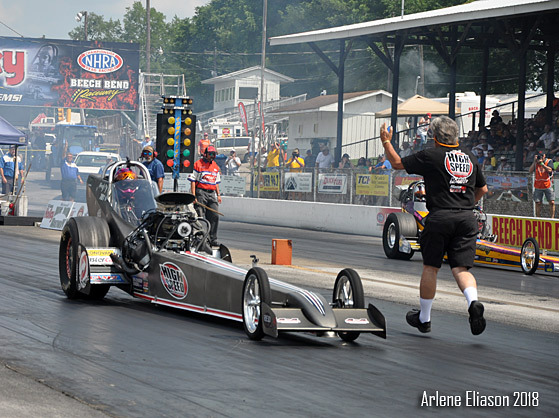 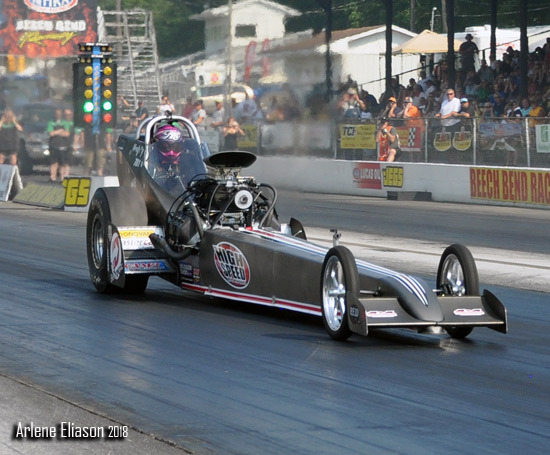 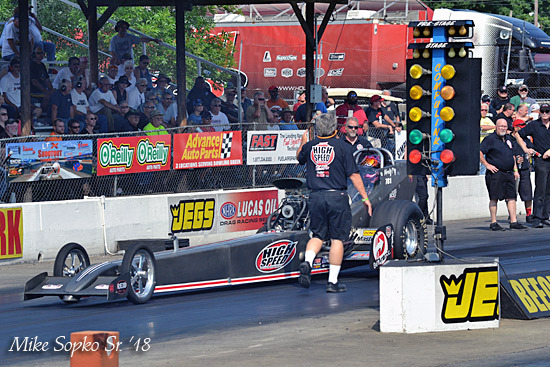 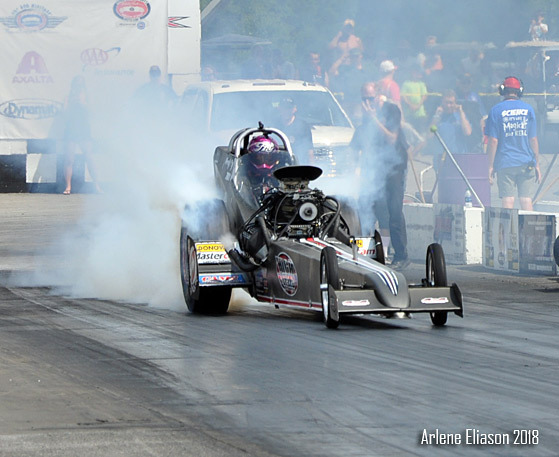 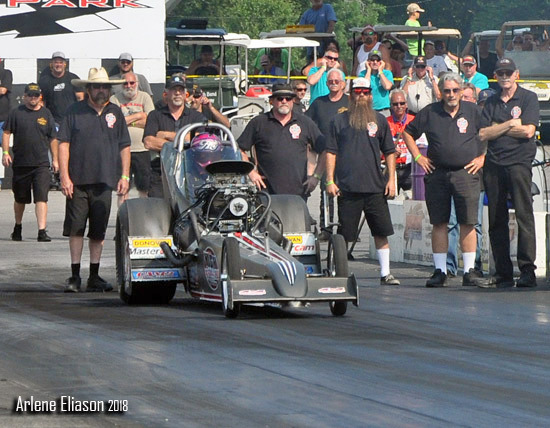 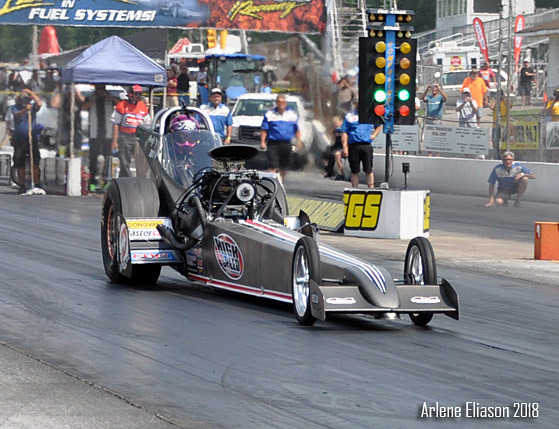 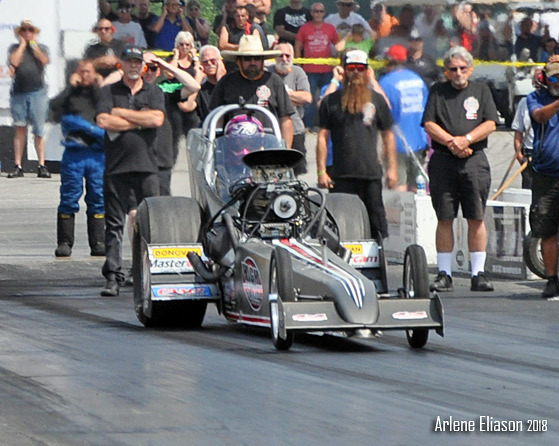 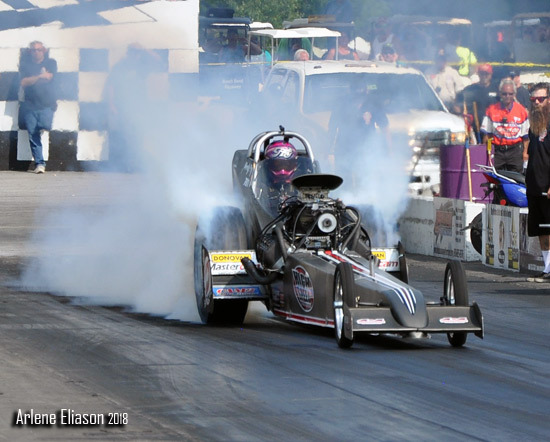 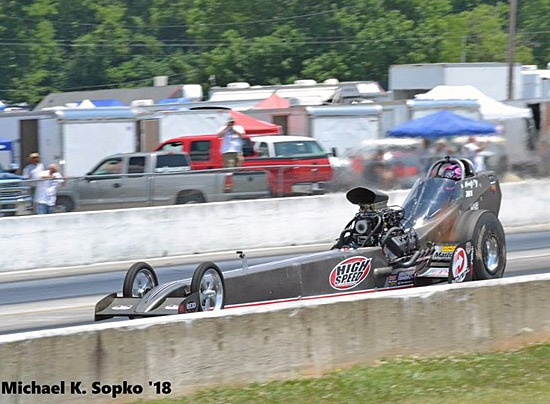 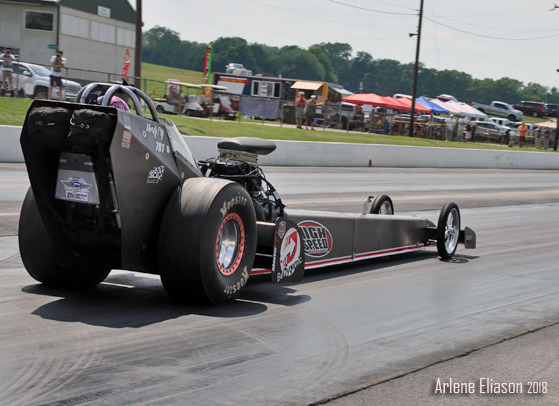 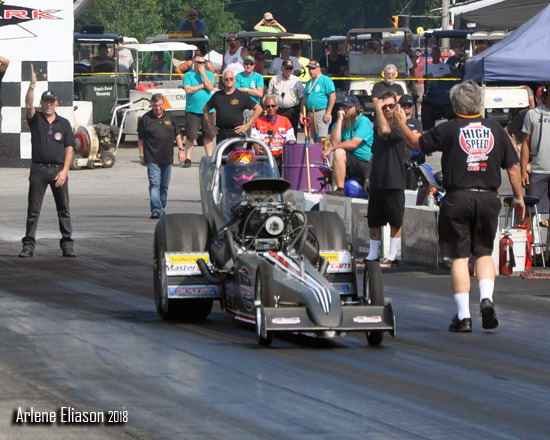 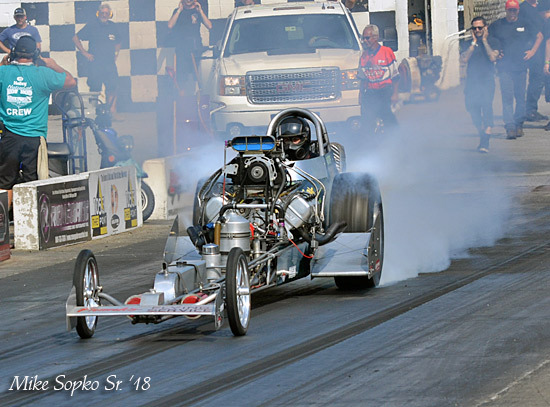 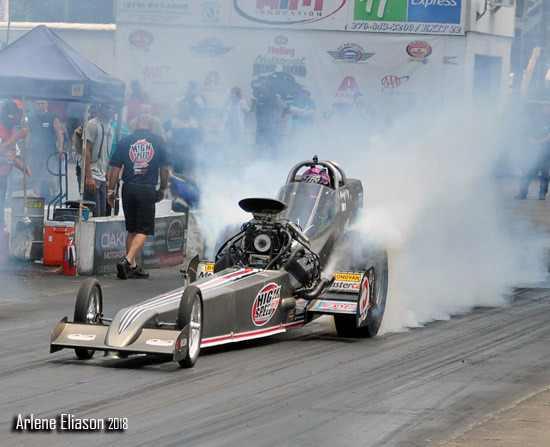 This year it was Mendy Fry who took the Top Fuel win with a 5.72 ET at 252 MPH over Jim Young who ran a 5.84 ET at 256 MPH. 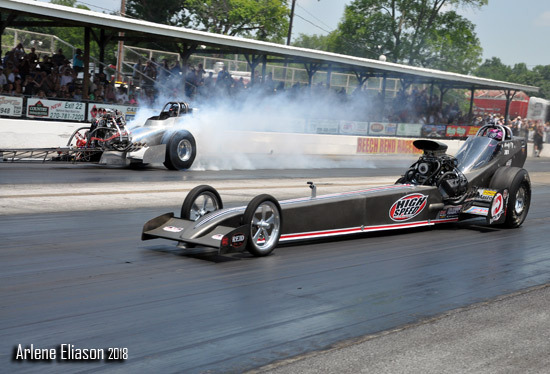 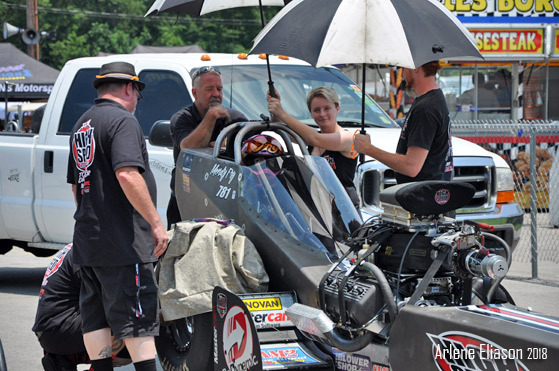 The final round was a dramatic conclusion to three days of sweltering racing action as front-engine Top Fuel contenders fought for a slot in eight car eliminations. 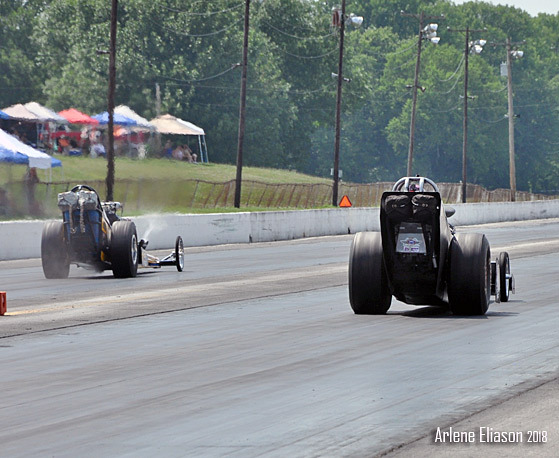 Fry and Young tossed the lead back and forth until everything changed at half track. 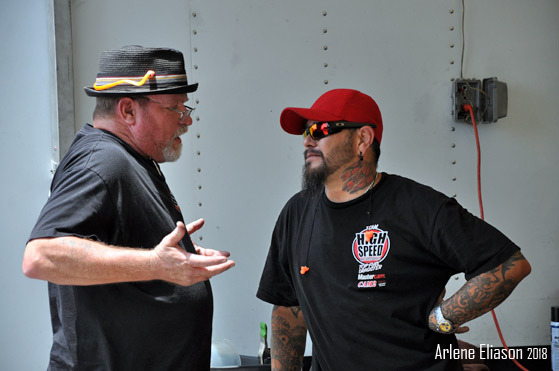 "He left on me with a .78 light to a .134 light. 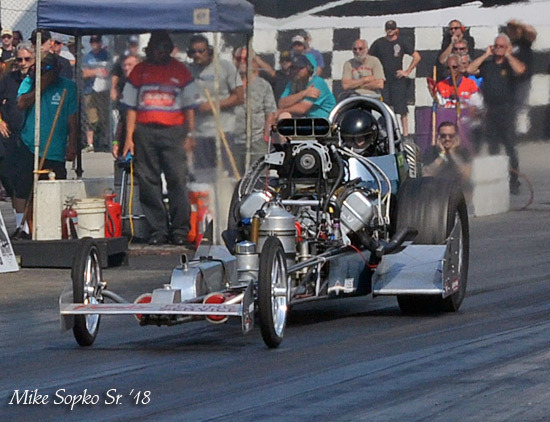 The lead changed a few times. 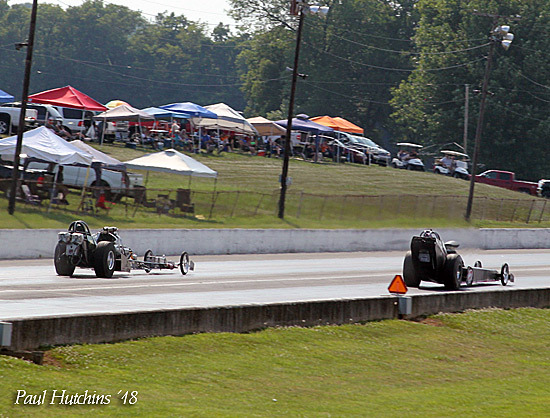 The incrementals were pretty close until about half track and then I didn't see him until I pulled the chutes!" 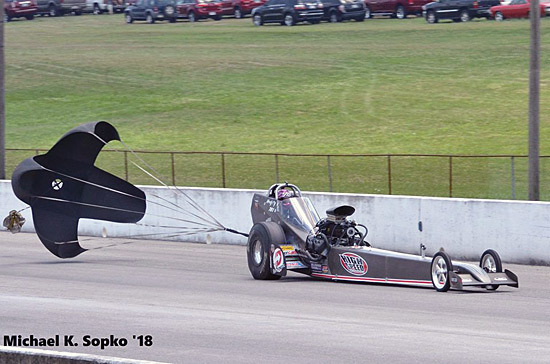 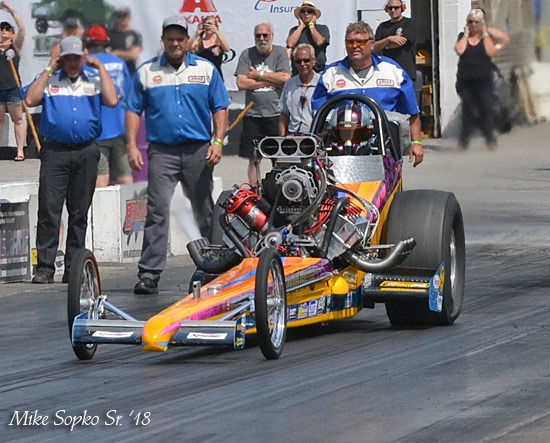 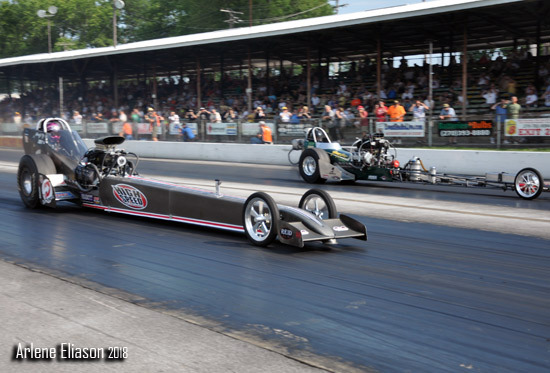 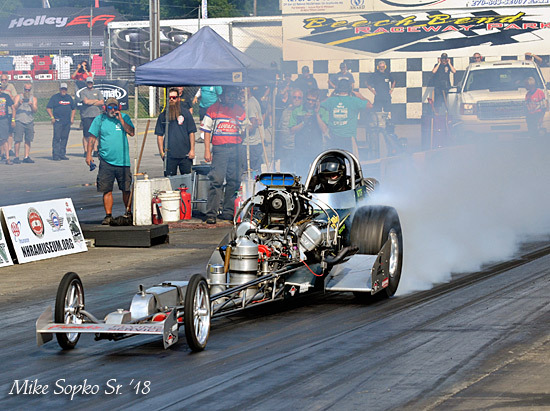 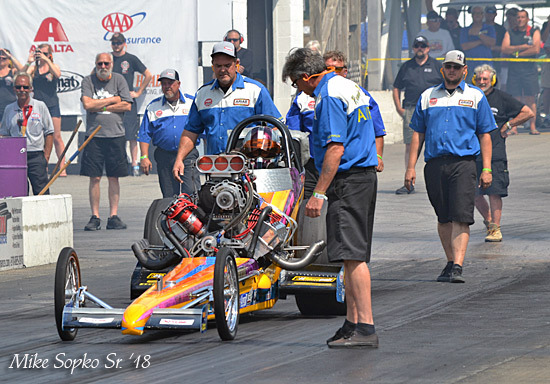 Runner-up Jim Young took the Young Guns dragster from the number two qualifying slot into the decider and posted event Top Speed even after getting out of the groove and drifting towards the wall before crossing the stripe at 256 MPH. 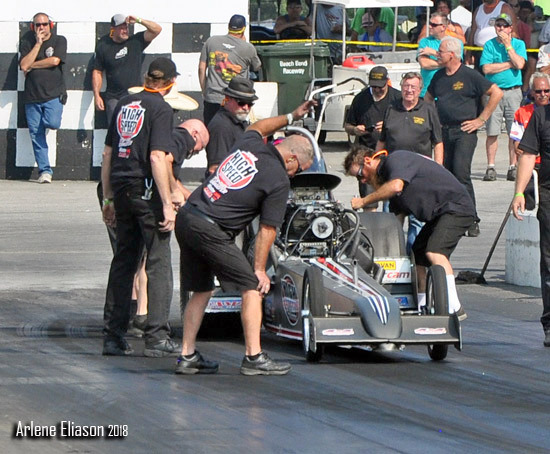 "It got away from me a little bit", said the Wisconsin-based contender, who didn't make the decision to head out to Bowling Green until the Sunday before the race. 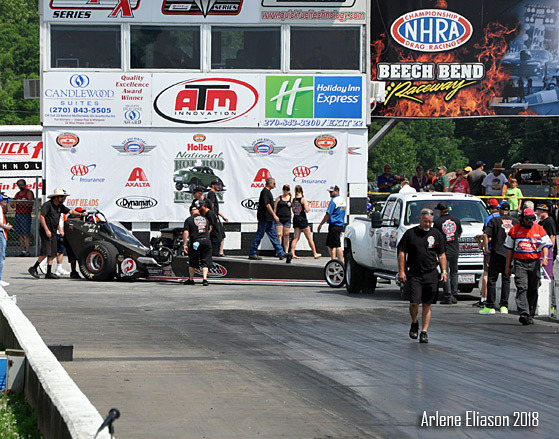 Young also grabbed Top Speed in qualifying with a 254 MPH blast and has his eyes on pushing the Young Guns dragster to 270 MPH. 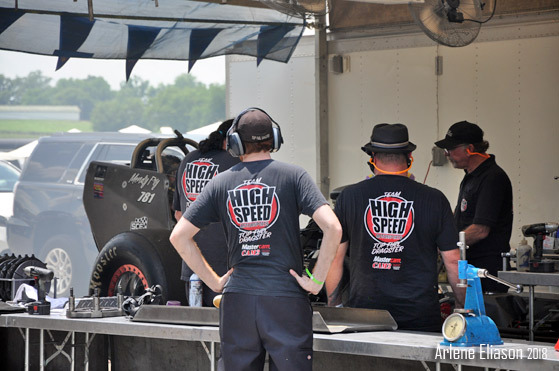 So fans, on behalf of High Speed Motorsports, we hope you enjoy this in-depth coverage. 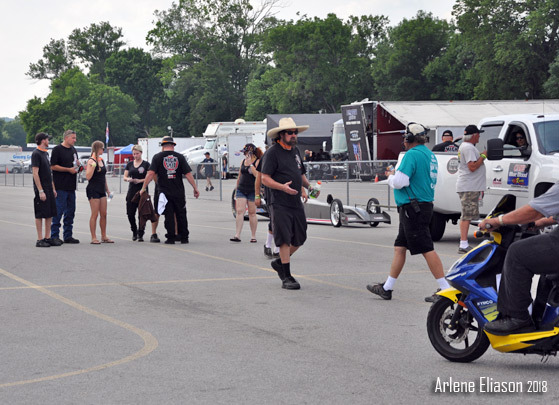 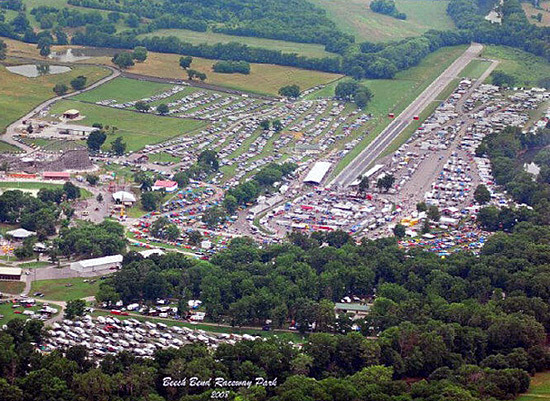 Welcome to Beech Bend Dragway. 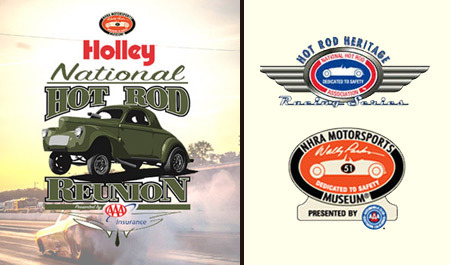 To share this event we're going to do something a little different. 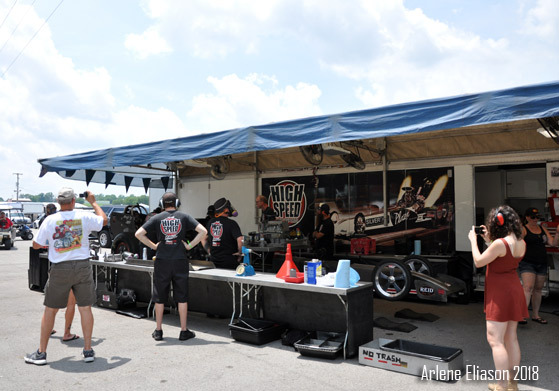 We'll start mid-morning Thursday at the HSMS pit area and give you a candid look at the team getting ready for the first qualifying session scheduled for later that afternoon. 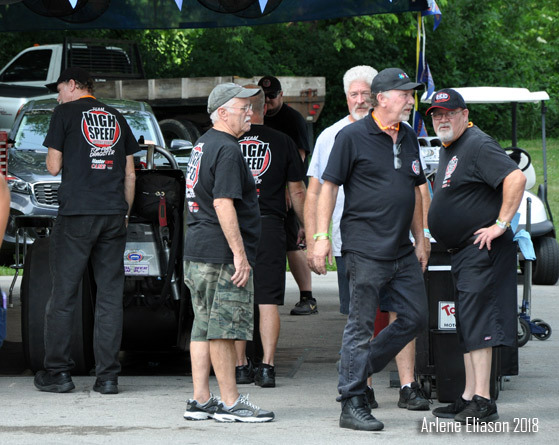 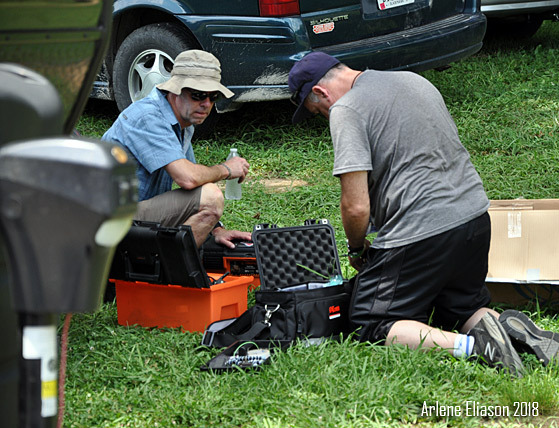 Car Chief Rick Shelar is a check and double check guy and his vigilance starts when the car comes out of the trailer. 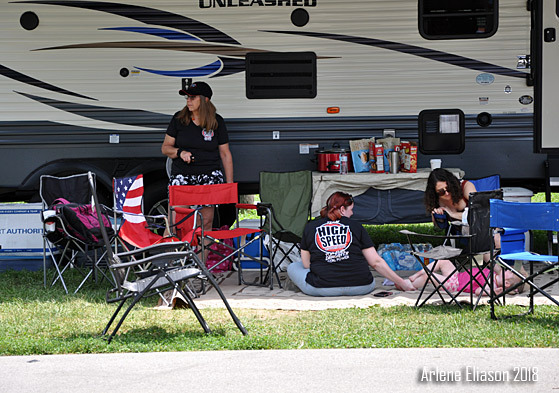 You want candid - Mendy in her lounge chair. 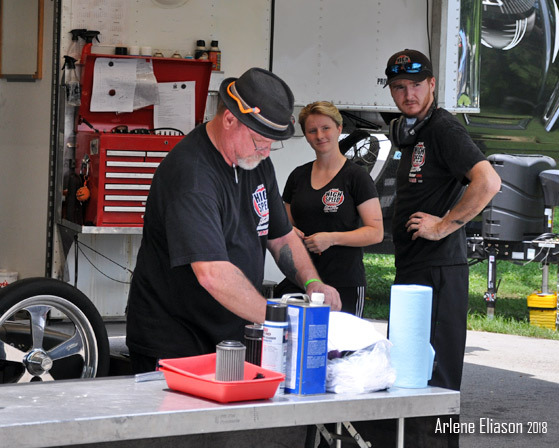 Eric Mc Morrow getting his post set-up as Alanna Kuhn and Dakota Fontes look on. 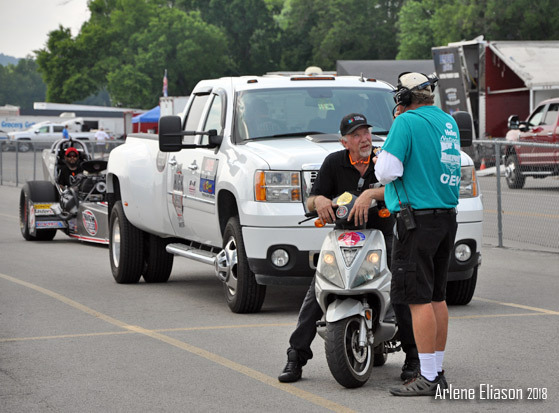 HSMS C.O.O & Team Manager Tom Shelar. 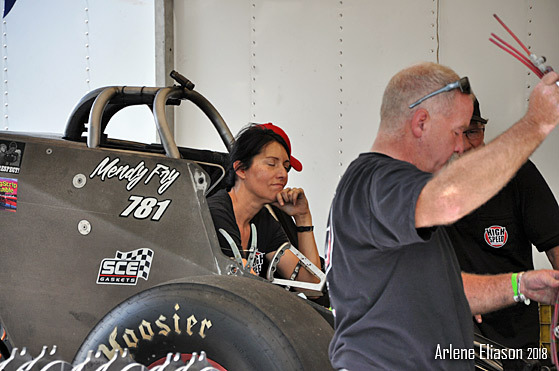 Eric and Al Renteria Jr.
Amy Dobson from the Hospitality girls waiting to shoot the warmup. 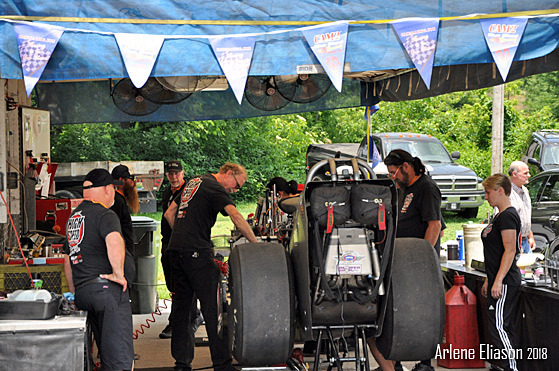 About an hour before qualifying the car gets warned up and checked for any problems. 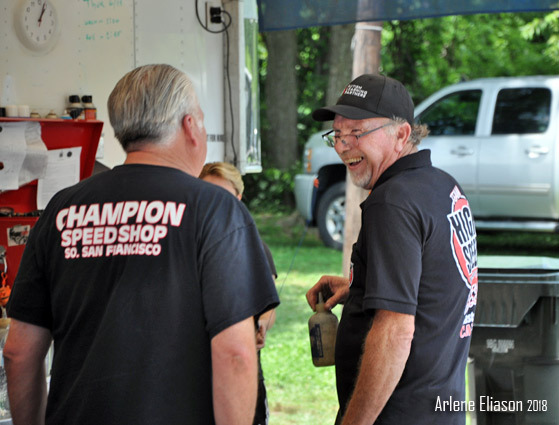 Champion Speed Shop owner Bob McLennan and eventual runner-up Jim Young. 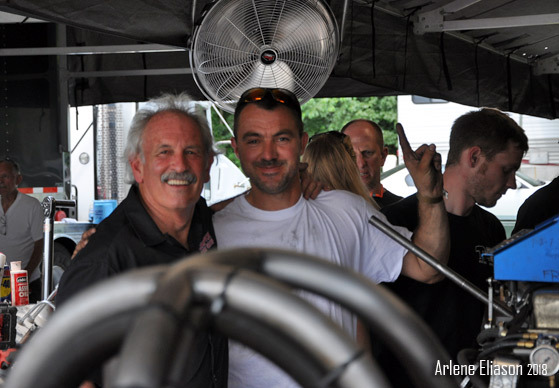 Frank "Root Beer" Hedge and Top Fuel vet Brendan Murry. 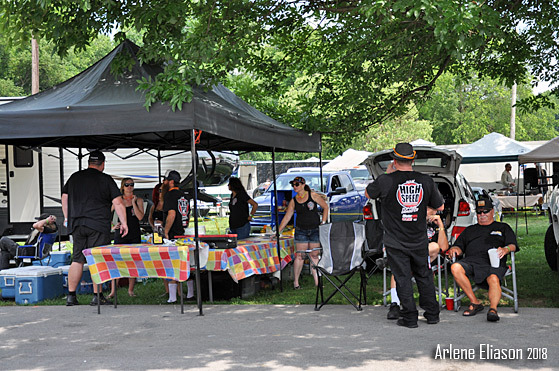 Takin' 5 in the shade. 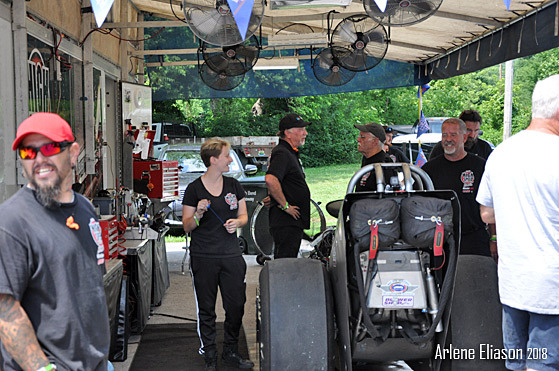 Time to roll to the staging lanes. 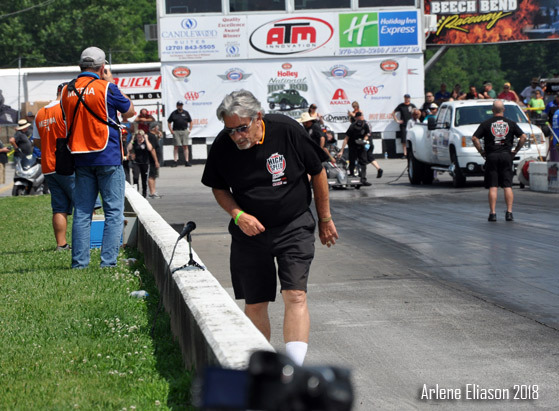 Walt Stevens saying "Hi" to a Drag Strip Rumble mic on his way out to backup Mendy. 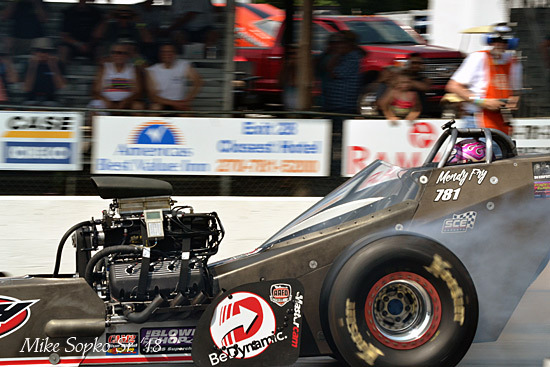 The first pair out to test the waters were Californians Mendy Fry of Los Angeles, CA driving the High Speed Motorsports car. 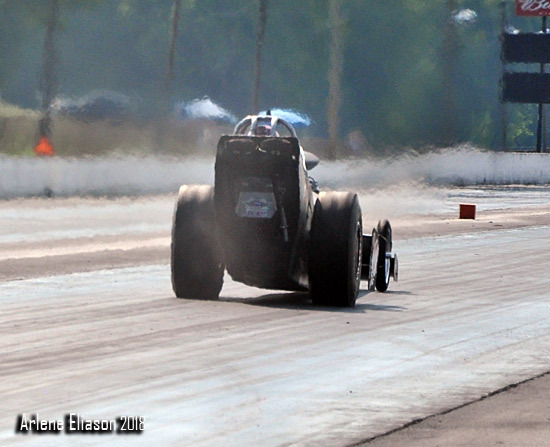 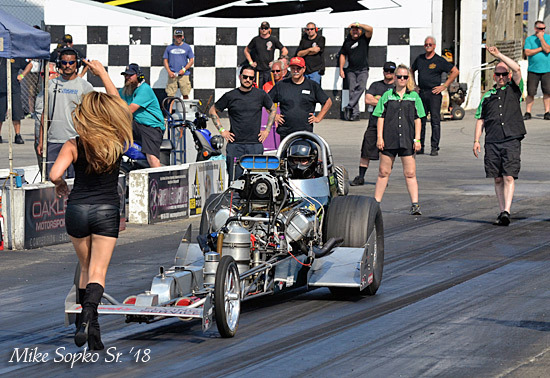 She went up against Brendan Murry from San Jose, CA in his Running Wild Racing fueler. 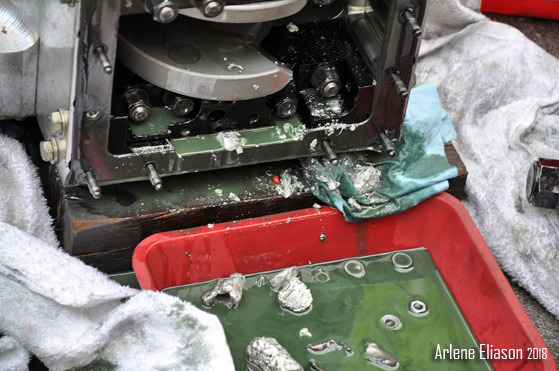 Murry had a couple of dead holes while Fry had problems of her own. 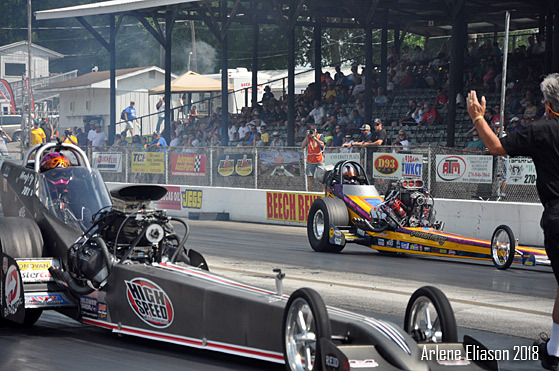 Murry got a 6.381 at 180.91 time slip while Fry got a DQ. 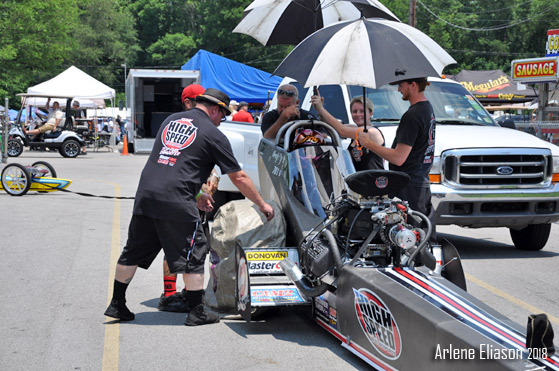 Different day, same heat and brutal humidity. 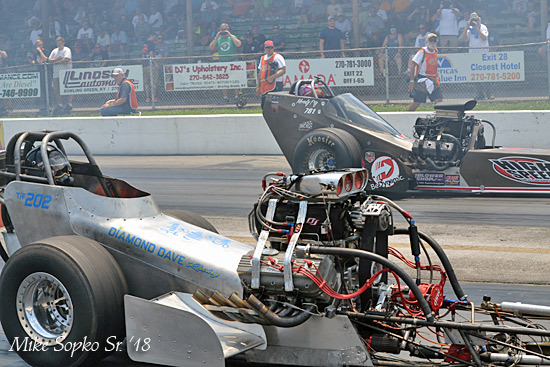 The second pair out pitted "Diamond Dave" Miller and Mendy Fry. 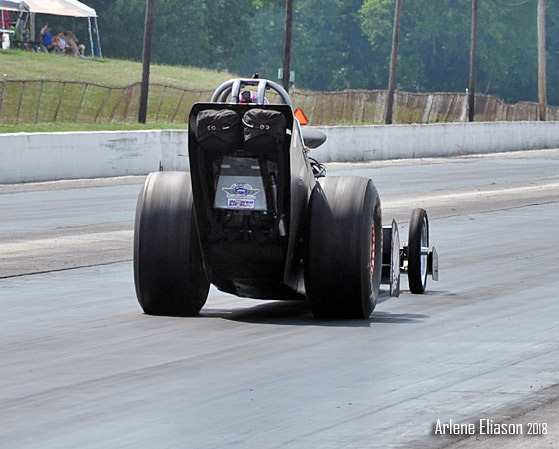 Fry stopped the clocks with a stout 5.680 at 235.97 which put her at the head of the class. 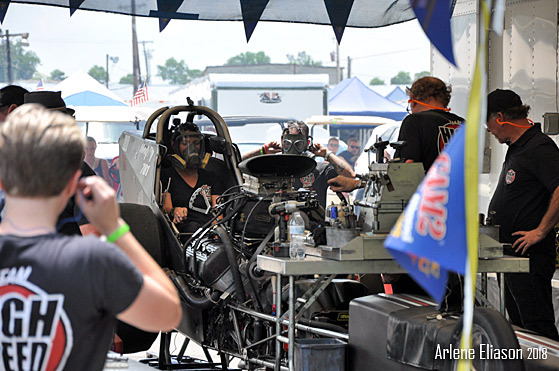 Miller's 8.24 at 111.53 left him on the outside looking in. 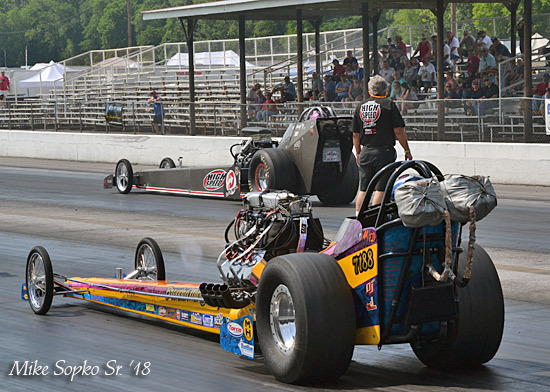 The final pair of the final session was Mendy Fry and her eventual final round opponent Jim Young. 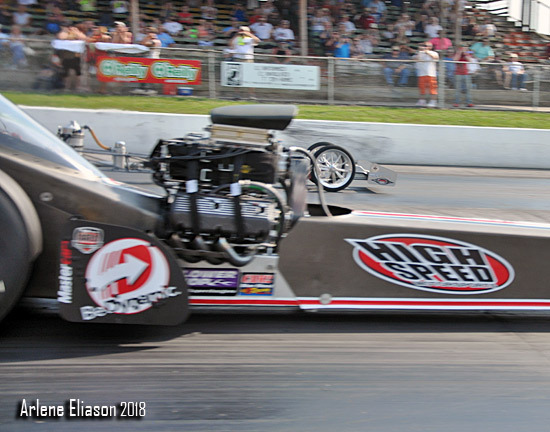 Q3 proved to be a pricey run as the oil pump failed at 2.8 seconds into the run. 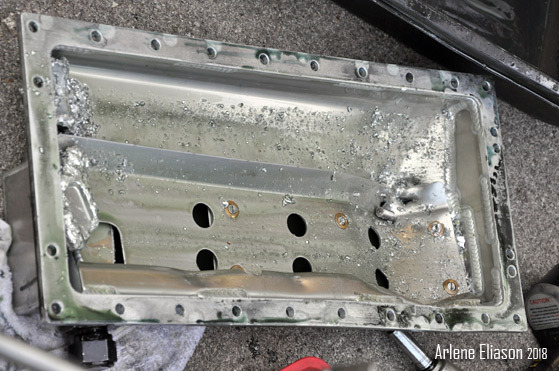 The result was connecting rod failures in the shut down area. 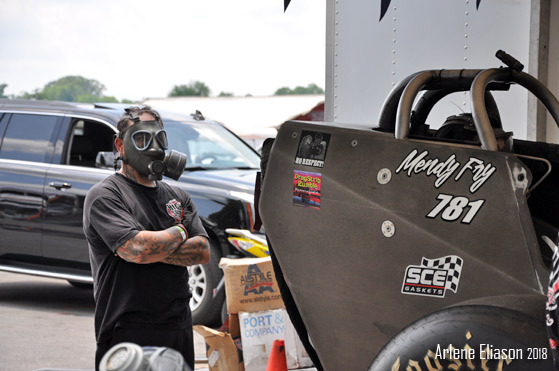 Time for a new bullet.